Real estate has, over the years, become like any other asset to be bought and sold with the aim of gaining from capital appreciation. While this can give good returns, it can also mean a hefty tax outgo. Irrespective of how the property has been acquired, the taxman looks at each and every real estate transaction. Those who churn real estate investments fast are likely to pay the highest tax. This is because if the property is sold within three years of purchase, the short-term capital gain is calculated by deducting from the sale price the cost of acquisition, the money spent on improving the property and the transfer cost. The gain is included in the taxable income for the year the money is received and taxed according to the person's tax slab. An investment gone wrong will result in a short-term capital loss. "Short-term loss from sale of a property can be set off against capital gain from any other short- or long term asset during the financial year," says Parizad Sirwalla, partner, KPMG India, a consultancy firm. The option of setting off shortterm loss against capital gain is a big advantage here. If the current year's capital gain is inadequate, the net capital loss can be carried forward for eight financial years for adjusting against any gain. Any profit booked after three years of buying the property is considered a long-term gain. The calculation is the same as that for short-term gain, except that the cost of acquisition and improvement is adjusted for inflation (called indexation ). Let's assume you buy a property for Rs 25 lakh and sell it after five years for Rs 35 lakh, making a profit of Rs 10 lakh. However, your actual gain will be lower after indexation. Long-term capital gains from real estate are taxed at 20%. You cannot claim regular tax deductions against long-term capital gains. Tax on such gains has to be computed separately. If your total income is below the tax exemption limit (Rs 2 lakh for individuals other than senior citizens), only the part of long-term capital gains above the exemption limit will be taxed (at 20%). Unlike in shortterm gains, losses from long-term assets can be set off only against gains from long-term assets. 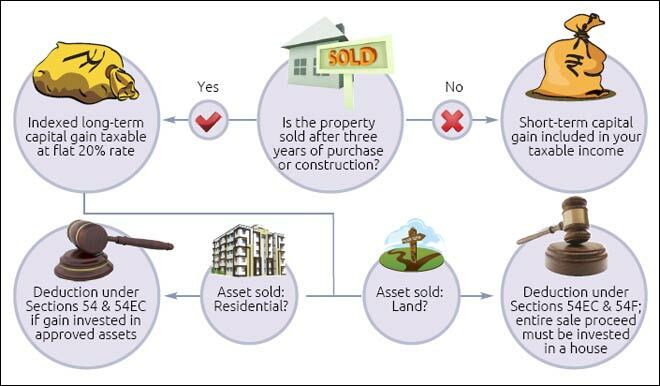 Sale of a property that is inherited or accepted as a gift will also attract capital gain/loss provisions even though you haven't spent any money to acquire it. 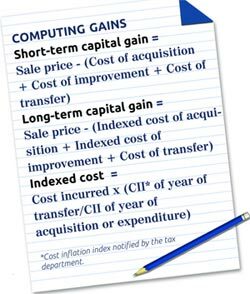 In such a case, capital gains will be computed on the basis of the cost to the previous owner, indexed to the year of purchase. "In cases where the property has been inherited, the cost to the original owner will be considered as the cost of acquisition for computing capital gains. If the property has been acquired prior to 1 April 1981, the acquisition cost will be the cost incurred by the original owner or the fair market value of the property as on 1 April 1981, whichever is higher," says Sirwalla of KPMG. For computing long-term gains, the purchase cost will be indexed based on the cost inflation index published by the tax department. If the property was purchased before 1 April 1981, the indexation figure for 1981-82 would be used. "Any money spent on improvement by the seller and the previous owner prior to 1 April 1981 will be ignored. For improvement expenses after this date, the indexed cost as per the relevant financial year will be added to the cost of acquisition," says Sudhir Kaushik, co-founder, TaxSpanner.com, a tax intermediary website. You cannot avoid tax on short-term capital gains. However, you can claim deductions to lower the tax liability on long-term gains. Buy a house: Houses are a popular investment option. Long-term capital gains from selling a house get tax exemption if they are invested in buying or building a new house. The new house has to be bought one year before the transfer of the first house or within two years after the sale. The deduction allowed is equal to the actual investment or the capital gain, whichever is lower. If you plan to use the gain to build a house, it has to be done within three years of the sale of the property. When you buy a plot to build a house, the cost of land is included in the construction cost. Even buying an under-construction property entitles you to tax deduction. "One can buy an underconstruction apartment to save capital gains tax, provided its construction is completed within three years of the transfer of the first property," says Kaushik. If the new property is sold within three years of purchase or construction, the deduction is reversed and taxed as short-term capital gain. Let us say you purchase a new house for Rs 15 lakh and claim a deduction of Rs 10 lakh. The exempted amount will be deducted from the purchase cost for calculating the capital gain in the next three years (Rs 15 lakh-Rs 10 lakh). Now suppose you sell this house after two years for Rs 25 lakh. Your capital gain will be Rs 20 lakh (Rs 25 lakh-Rs 5 lakh), even though the actual appreciation is only Rs 10 lakh. If you buy an under-construction independent house and resume construction, the cost incurred in further construction will also be eligible for tax exemption under Section 54 of the Income Tax Act, says Kaushik. In cases where capital gains have been made by selling land (or any asset other than a house), the investments required for deductions are different. Full deduction is allowed (under Section 54F) in cases where the entire sale proceeds are invested in a new house or used to build a new house. If you use a part of the money, the deduction will be proportion of the invested amount to the sale price. The time-frame for investment is the same as that for capital gains from residential property. You should not own more than one house prior to the investment. The deducted capital gain (from non-house assets) becomes taxable if you buy a new house within one year of the transfer of the original asset or construct a new one within three years. If the new house is sold within three years, the deduction claimed will become taxable as a long-term gain. If you do not want to lock the entire proceeds in a residential property, you can invest the capital gain in specified bonds. Buying or constructing a house generally takes a long time. If you fail to make the investment before filing your tax return for the financial year, you can still avail of the deduction by letting the taxman know about your plan using the Capital Gains Account Scheme (CGAS). "An individual can deposit the capital gain in an account opened under the Capital Gains Account Scheme with any public sector bank if it has not been fully utilised for purchase or construction of a new property. 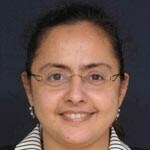 This has to done before the deadline for filing the return," says Kaushik of TaxSpanner.com. The deposited money can be used only to buy or construct a residential house within the prescribed time frame. Failure to do so will lead to taxation of the unutilised amount as long-term capital gain after three years of the sale of the first property. There are two types of capital gains deposit accounts-savings deposits (type A) and term deposits (type B, with cumulative or noncumulative interest options). You can transfer money from one to another by paying fixed penalties or charges. You can withdraw money from type A accounts by giving a declaration that the money will be used to buy or construct a house. In such a case, you will have to use the withdrawn money within 60 days and deposit the unutilised amount, if any. The interest rates paid on these accounts are the same as those on regular savings and term deposits. You will have to pay tax on the interest earned as it accrues in your account, but it cannot be withdrawn. You will have to attach the proof of the deposit with your return. If the deposited amount is not used fully to buy/construct a new house, the remainder will be treated as capital gain at the end of three years from the date of the sale of the original asset. If you do not intend to invest in a house, you can buy specified financial assets. "Capital gains from sale of any long-term asset can be claimed as tax-exempt under Section 54EC of the Income-Tax Act by investing in notified bonds within six months of its transfer," says Sirwalla. These bonds are issued by the Rural Electrification Corporation and the National Highways Authority of India. The exemption is equal to the investment or the capital gain, whichever is lower. If you transfer or take a loan against these bonds within three years, the capital gain will become taxable. You can invest a maximum of Rs 50 lakh during a financial year in these bonds. If you have a capital gain of more than Rs 50 lakh where the six-month tenure extends into another financial year, you can invest the remaining amount as well. However, it can lead to disputes. "Making investments in specified (Section 54EC) bonds over two financial years has been a subject matter of litigation with the tax authorities," says Sirwalla. The purchasing power of the rupee keeps declining with inflation. So, calculating profit based on the purchase price fails to reflect the assetâ€™s true appreciation. The cost inflation index, published by the tax department every year, is used to reduce inflationary gain accrued during the assetâ€™s holding period. If a property is purchased before 1 April 1981, the fair market value on that date is used to calculate the gain. There are no fixed rules for calculating the fair market value of a property. From 2012-13, long-term capital gains from sale of a residential property will be tax-free if the sale proceed is invested in a small or medium enterprise in the manufacturing sector. The fund should be used to acquire new plant and machinery within six months. You become eligible for an investment made before due date of filing the income tax return, provided your equity holding or voting power after the investment is more than 50%. When you sell farm land, you do not have to pay any capital gains tax on the profit earned. The exemption is not valid if the land is within the limits of a civic body (municipality, municipal corporation, town committee or a cantonment board) with a population of 10,000 or more at the beginning of the previous year. It also does not apply if the land is within 8 km of such civic limits. If you have made capital gains from sale of land used for agricultural purposes (by the assessee or his/her parents) for at least two years before the transfer date, the money can be invested in any land for agriculture. The invested amount then becomes eligible for deduction. The exemption is withdrawn if you buy another land within two years of the deduction.